Made in the USA, GROCO C-60 and C-80 deck wash kits deliver flow and pressure on demand for tough anchor wash and deck wash jobs. 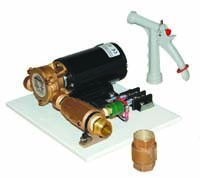 Vane pumps provide greater performance than diaphragm or flexible impeller pumps. Up to 6.5GPM (C-60) or 7.5GPM (C-80) in the 20-40PSI pressure range. "Ignition Protected" Permanent magnet ball bearing motor has #316 SS shaft. C-80 has replaceable motor brushes.